What is the purpose of Future Allstars? This experience is more typical of the length of a school day and pushes the social envelope for them. The hope is that the social skills already being taught during the school year will not regress over the summer, but instead will generalize and be used in typical age appropriate social activities. Therefore, providing a “social edge or leg up” for the student when school restarts in late August. Those that enroll in the camp will find that they are being expected to be involved socially the entire day and there is little down time to escape, avoid, or be invisible. There are also many opportunities to have personality conflicts, become irritated with someone, etc. that are similar to day to day real life situations everyone is expected to learn to work through. Staff assists all members through challenges created naturally in a real world social environment. 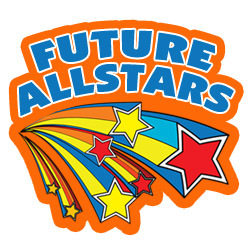 Stamina, problem solving, understanding cause and effect, regulation, learning to be cooperative, and acceptance of outcomes is emphasized at Future Allstars. Communication, personal responsibility, team work, sharing ideas, and remaining involved are heavily emphasized. What is the structure of Future Allstars? Due to a limited number of spots, no camper will be admitted beyond when the open enrollment period closes. There is no wait list for this program either. Once the slots are full, admittance ceases. How Do I Obtain An Enrollment Packet?